For many women, pregnancy is a surreal experience full of many changes as the body expands to accommodate a new life. While those physical changes can be "immediate, all-consuming and violent," as Sarah Menkedick notes in Homing Instincts, it's the internal journey where the heart and truth and loneliness fully exists. What a wild journey it is, she says, this "Zen state or acid trip." Homing Instincts is the book I wish I had had then. It’s the book I would want to share with new moms I know today, because Menkedick renders this experience of self-discovery through pregnancy and motherhood with such vulnerability, intelligence, and grace. In eight captivating essays, world traveler, Fulbright Fellow, widely published author, and founder of Vela, Sarah Menkedick takes us on a journey from a place of constant motion to stillness. From a place of racing toward the future to being present. From achievement to waiting. From knowledge to the understanding that sometimes we shed all that we know and learn anew. Menkedick writes beautiful, raw, honest descriptions of her pregnancy. "I am slow, still, everything I do during this time . . . deliberate as if I might break a delicate understanding between me and this place, as if I need to move with the nearly invisible precision of an opening flower." After years of study and travel, she and her husband return to Ohio, "the tame middle" from which she once sought escape. Yet it’s also the place in which she grew up, the place that imprinted itself on her long ago in the cities of Columbus and Cincinnati, during the hikes her father took her on as a child. In Menkedicks's words, "[my father] instilled in me a love for the woods. The woods, that distinctly Ohioan place: not forest, not regal pines or shimmering birches, but sturdy ash and smooth barked maple, black walnut and American elm." Although for years she sought adventure and movement and extremes, now Menkedick finds she "does not want to grab at opportunity but simply to be where I am," and realizes the place she wants to be "is this modest patch of the Midwest where I grew up." As if the land is calling her back, her own homing instincts pulling her home. Now her journey unfolds on 40 beautiful acres of Ohio farmland as the seasons spread out before her. The land is a character in this collection as Menkedick struggles to understand her new self on this rural landscape in southeastern Ohio, a place that is her home again. Again she writes about the trees: "It is a chilly October Day. In the morning, from the cabin porch, I watch the slow-motion glitter of gold maple leaves adrift in the churchly woods." Later, the fatigue and nausea of pregnancy bring her daily runs to the lake to an abrupt stop: "I brace my palms on my knees, put my head between my legs, and weep. The valley shines with the finite fall bursts of copper and vermillion and gold and reinforces the fact that I am doubled over, shattered. Who is this person and what is this life?" Walking the land with her husband in the winter, "The night is silken with cold and blue, the shadows of branches crisscross us, our interlinked arms." She watches as "the cherry trees sprout their first buds, and one day the daffodils have opened, and then spring beauties spread like scattered white confetti around the newly green grass." And it is in that "summer dusk," when "long sashes of peach light fall over the pastures" where Menkedick contemplates how her understanding of reading and writing have changed now that she is pregnant. Instead of seeking purpose she realizes, "I want the heady, dreamy immersion of novels or of stories so intimate and pressed up close to a life that they have no bigger picture. I want to feel the world called up, depicted in its contradictions and coincidences and complex schemas I want to merge with it, with its mystery." Becoming a mother for the first time definitely propels women onto a landscape of discovery, and Menkedick writes about it in such a reverent, spiritual way. The reader learns along with her about these paradoxes of life, of motherhood, of writing--how motherhood, this deepening of emotion and compassion, is both common and awe-inspiring. The baby acts as a screen between me and the world; she is the ultimate newness, the ultimate exoticism, the ultimate discovery, and everything else pales behind her, everything else I experience predominantly through her. The tightly spun cocoon of motherhood renders the world distant as stars, and yet at the same time its details become more intimate, more personal, part of a shared humanity that transcends context and borders. Throughout the essays, she sheds what it means to be successful and fulfilled. Using literature, the Ohio farmland, Oaxaca, and Buddhism, she builds herself a compass that leads her home. As she goes through changes she takes the reader along for the journey, "a deepening and narrowing," a "relearning," and developing of her homing instincts. Menkedick travels from an outer landscape to an inner one: "For the first time, I recognize this delving into my own heart, mind, body as a journey." 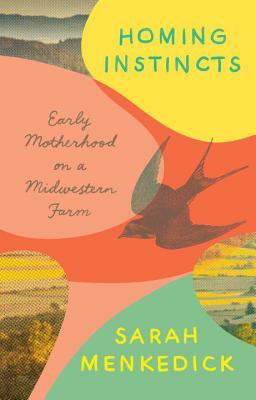 Throughout the book, her relationship with the Ohio landscape symbolizes her growth into and acceptance of motherhood. At first, she struggles with Ohio, with not feeling some measure of self-disappointment at going back there. She admits, "So, there is nothing left but to recognize that insignificance, banality, smallness, are all there is; they come sprouting up through the loam of pregnancy, bare as the first green shoots in the hot boxes." As her ideas of what it means to settle change, she writes, "I have never conceived of Ohio in terms of wounds or beauty, and for a long time I have hardly seen it as a place." But, "in pregnancy," she says, "I discover Ohio as my own motherland." She begins to see the role Ohio plays in her life and opens herself to its beauty through her words: "The ridge is a palette of Ohio winter colors: storm and wheat, navy and honey, ice and yolk. An old road, long overgrown, runs along the ridgetop. Breezes, not yet bracing, stir the dried sumac and the grandfatherly pines." As much as Menkedick comes to know and understand her new self in these roles of mother and writer, it is also an unlearning, or relearning. Both her old and new ways are in conflict. She is learning to pay attention to everything around her, the farmland in Ohio, family in Oaxaca, while breastfeeding, while running, singing, making love. To pay attention to life. She opens her mind and lets herself be softened, not through indifference, but by opening herself to the complexity and empathy required in this new life. I have abandoned many pregnancy and motherhood books over the years, but Homing Instincts is a book I will hold close to my soul, because it illustrates everything we go through when letting go of our former selves to become mothers, when rewriting our own stories to include motherhood, and, as Menkedick writes, being "open above all to not knowing who I am, where I’m going." This book is both hard to read and hard to put down. Menkedick exposes the uncertainty and vulnerability of her own, and every new mother's, heart. Pregnancy is the kind of transition "that wrenches us completely from the stories we have long told about ourselves, and rewrites us." Although her essays take a somewhat linear path, from coming home to Ohio, to pregnancy, to the birth of her daughter, to parenthood, where she can now see everything her parents did for her as a child, there is this constant thread throughout, that her growth as a mother is never finite, and never as simple as a straight line. Homing Instincts is a journey for each of us, each character, each woman, and especially each mother. Menkedick takes us from the external to the internal, and sometimes back again on a continuous path of self-learning as she navigates the constant ebb and flow of life. Sara Ohlin lives and writes in Bangor, Maine. Her essays can be found at Mothers Always Write, The Good Mother Project, Feminine Collective, The Manifest Station and the anthologies, Are We Feeling Better Yet? Women Speak About Health Care in America, and Take Care: Tales, Tips and Love from Women Caregivers. She’s a contributor to Her View from Home and currently writes about life, food, and motherhood on her blog. I think I might have to read this!